In a word dominated by constant algorithm updates and product launches, Google’s release of this polished, beautifully crafted, and highly informative magazine (or book as it is referred to by the search engine giant) offers a more reflective and in-depth look at the wider issues surrounding online business. “Although the vast majority of businesses are highly aware of the importance of online marketing, and SEM in particular, there remains a degree of inhibition regarding the ins and outs of search engines and the extent of the importance of active engagement with search engine optimisation. “Think Quarterly will hopefully serve to demystify some of the more inaccessible tenets of search engine operations by reaching out to businesses on a more accessible level. SEOWhat.com, an Internet marketing, search engine optimization and web design firm helps prepare clients’ sites for this year’s holiday shopping season with festive banners, improved rankings and social media buzz. The holiday season is one of the busiest for online shopping sites and this year’s economic situation will increase the competition among merchants. The design team at SEOWhat.com specializes in creating eye-catching banners, holiday logo enhancements and overall web site design. Clients like www.bigsmiletoys.com chose a holiday-themed logo to make its site welcoming to potential customers. In addition to aesthetics and SEO site development best practices, SEOWhat.com generates buzz for clients and manages their reputations online employing the myriad of new and emerging social media and social networking tools available. SEOWhat.com helps clients improve search ranking through a combination of search engine optimization strategies that include, but is not limited to, social media optimization/Web 2.0, social bookmarking, press release and article writing and submission, on page/off page optimization, niche keywords and long-tailing, link building, meta tagging, Yahoo! merchant sites (Y! Stores), YouTube/video submissions and more. Ranked best in Social Media Optimization by TopSEOs.com, SEOWhat.com creates buzz through the use of social networking tools such as blogs, social bookmarking sites and social networking sites such as Facebook and Twitter. The full service agency provides a la carte or full service SEO strategies tailored to the needs of B2C, B2B, products and services, businesses, educational and not-for-profit organizations. With a talented team of web engineers, graphic designers, copy writers, editors and online/offline marketers, SEOWhat.com is the only competitively priced firm of its kind that is based entirely in the U.S.
SEOwhat.com is an SEO services agency that helps companies navigate the dynamic world of internet marketing, integrating search engine optimization (SEO), search engine marketing (SEM), social media optimization (SMO) and Web site design to increase a site’s visibility. Specializing in Yahoo! and Google optimization, SEOWhat.com develops search friendly Web sites on a variety of platforms including Yahoo! Stores, WordPress and custom built sites. In addition to Google SEO, SEOWhat.com provides organic search results, without the price tag, creating powerful web sites that appeal to human eye and search engines alike. National SEO , Global SEO – Mirror, Mirror on the Web, Who’s the Fairest of Them All? That’s what we say everyday, when peering into our looking glass of this information age: our computer monitors: “Who’s the fairest of them all?” In other words, whose website is #1, or at least on Page 1 of Google, the juggernaut of the SEO (Search Engine Optimization) world? One of the technologies used by one of the leaders in National SEOand Global SEO and in their own backyard, Denver SEO, USWebCentral has one of the highest technologies available these days: Video SpokesPerson on your website. Another aspect is how to obtain more “square footage” high on search engine results pages. What is a Video SpokesPerson? It is a filmed person, walking and talking on your website, in a 30 second commercial/ introduction, superimposed right onto the homepage of a website, or on any webpage. The SpokesPerson discusses the most important aspects of a company’s mission, presenting it in a compelling manner that is hopefully interesting to potential clients. The desire is that the SpokesPerson’s presentation will create a Call To Action, resulting in the potential client phoning or e-mailing the owner of the website to do business. Carvin knows that owning an entire page on search results is a Nirvana-like utopian result that is not likely, but he has seen something near this with some of his clients’ search results. He is a client advocate whose desire is to place them on a pedestal for the whole world to see. Check out the Denver search engine optimization company online! Lakestar Media today announced that it has driven through a deal with Sunwin New & Used Motors to provide SEO and PPC for the company’s motor sales and bodyshop website. Part of The Co-operative Group, Sunwin Motors operates a number of car and van dealerships and bodyshops throughout the North and Midlands. Lakestar Media recently moved into larger premises in order to accommodate an ever-expanding list of clients, and has increased their services offering in order to help cement their place in the digital marketing world as a leading UK agency. Lakestar Media is a leading digital marketing agency offering a professional and individually tailored service to its diverse and exciting client portfolio. Established in December 2007, Lakestar Media delivers a mix of search engine optimisation (SEO), paid search (PPC), affiliate marketing, display advertising (OMP) and social media services for their customers. Site Booster has devised affordable website promotion services in form of SEO service subscriptions for small businesses. Website and blog owners can easily subscribe for a period of 6 months and leave their link building campaigns to Site Booster at discounted fees. They will receive reports on the search engine optimization services on a monthly basis. During this period, article marketing service is combined with search engine optimization and social media marketing. 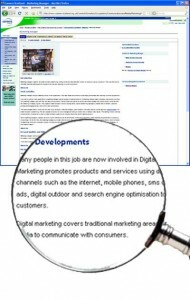 It has always been a concern for various websites to conduct content creation according to SEO copywriting techniques. They prefer to focus mainly on their own businesses. With the emergence of Bing alongside Google, things have become even more complicated. Article marketing is the safest method of content creation and content syndication that builds lots of one way links. SEO service subscription at Site Booster requires clients to go through two stages: website optimization service as a one-time setup job and then monthly website promotion services. At setup stage, Site Booster checks up and optimizes the site or blog of the clients. At the next stage, it proceeds to conduct content creation and syndication. The performance reports at the end of each month help clients realize what has been achieved for them. Site Booster conducts website promotion services on a regular and consistent basis for at least a period of six months. As many have felt relieved by not having to do this job themselves and seen results improving their search engine rankings at Google and other major search engines, they prefer to continue subscription. So, such affordable SEO services are the solution Site Booster has offered. Site Booster is a website promotion company providing affordable SEO services for its clients conducting keyword discovery, content writing, article marketing, press release and social media marketing. Although details of the deal are as yet unclear, reports from numerous credible news outlets worldwide suggest that after many months of negotiation, the global giants are set to unveil an agreement that will see Yahoo sell search ads under Microsoft’s nascent Bing brand. While estimates of the global market share the partnership will hold vary from 12% to 30%, Europe’s largest independent digital marketing agency believes that the news will have a positive impact upon the industry. “It’s been 18 months since the rumour mill first started touting the possibility of a deal involving Yahoo and Microsoft, and the industry as a whole will be delighted to see what’s become the search business’ longest-running soap opera finally approaching a conclusion. The devil will be in the detail, but given the alarming dominance that Google has held over the market for so long, the prospect of a serious challenge to their position is good news for everyone,” said Lyndsay Menzies, Chief Operations Officer at bigmouthmedia. With the precise details of the agreement still a closely guarded secret, the news that Yahoo has finally succumbed to Microsoft’s advances has spawned widespread speculation over the deal’s possible ramifications. While the prospect of a serious competitor to Google’s Adwords system is being touted as a move that could help push PPC advertising prices downwards, other commentators have suggested that the deal could force the search giant to reconsider its policy against paying commission to partner agencies. “There are still more questions than there are answers about this deal, but If Yahoo’s paid search ads are powered by Bing then we will have another credible search engine to consider for paid search budgets. That may result in some instability as bid management platforms adapt to cope with the new landscape, but it will help keep cost-per-click prices down,” said Andrew Girdwood, bigmouthmedia’s Head of Search. Bigmouthmedia’s multilingual digital solutions deliver outstanding ROI for over 300 world leading brands including British Airways, Tesco, ebay, Sky, Cisco, BT, Comic Relief, Barclaycard and Europcar. Mr-SEO, a U.S. based company that specializes in search engine optimization and internet marketing, has introduced four affordable seo starter packages to help businesses cope with the strained economy. Launched in 2004, the mission of Mr-SEO has been–and remains–to offer top quality, affordable SEO and online marketing services. With its high quality customer service and standards of performance, the company is dedicated to help protect businesses f r o m the “too good to be true” types of SEO offerings that will hurt a company’s standing in the search engine rankings rather than help them. President and owner Greg Gaskill knows that businesses need to ramp up marketing efforts during slow times, and slow times are often when they can least afford it. He and his team have made it their business to help companies thrive in the current hostile economic environment. However, he also knows that there is no such thing as “instant SEO” or “automated secret weapons” of online marketing, therefore these Business Starter Packages incorporate the same proven principles used in larger projects, but on a smaller scale. Although smaller in scope, these targeted services produce significant results – results that create a solid foundation to continue to grow f r o m which can mean the difference between survival and failure in tough times. These new packages offer businesses the same award-winning Mr-SEO quality including the company’s Social Media Marketing, Blogging with Ghostwriter, Pay Per Click Advertising, and Search Engine Optimization packages, designed to get businesses into the top search engine rankings ethically and for long term success with affordable SEO and online marketing strategies. Mr. SEO is a Seattle, Washington based company that performs all work right here in the United States. With memberships in Washington State’s Better Business Bureau and the Search Engine Marketing Professionals Organization (SEMPO), the company has been featured by Start-Up Nation, Linked-In, Resource Nation, Evan Carmichael, various E-Zine articles, and even received mention by The Wall Street Journal. To read about how Mr. SEO’s mission and goals fit in with your needs, go to Affordable SEO. For package details and more information on Mr. SEO and the various packages available go directly to their page at Online Marketing Services. To read the company’s blog–go to Online Marketing Strategies. While you’re there, explore other details about the company and its mission to help business achieve more with affordable SEO services. Europe’s largest independent digital marketing agency praised the new service, due to be unveiled on the back of a reported $100million promotional campaign, as a potentially crucial landmark in the online search sector’s development. Citing Microsoft’s pan-European approach and collaboration with key agencies in advance of the launch, bigmouthmedia believes that Bing could add a refreshing new dynamic to the industry. “Competition is always welcome. It has been some time since the search industry had a realistic alternative to Google, and if Microsoft’s new engine can provide that then it will be of obvious benefit to both digital marketers and consumers alike,” said bigmouthmedia CEO Steve Leach. Praising Microsoft for its willingness to work closely with key SEO agencies in advance of the launch, bigmouthmedia expects the Redmond giant to get a number of things right. While services such as Yahoo do not treat large parts of Europe as distinct territories, Bing is expected to see its European launch followed by the introduction of a range of country-specific services. Similarly, it is expected that we will also see Bing evangelists active in Europe and not just the US. Bigmouthmedia’s initial assessment of the new service is that in its initial incarnation Bing will do enough to generate coverage and interest but be familiar enough not to scare users away. Microsoft also clearly understands the importance of searcher confidence in relation to the perception of good search results. 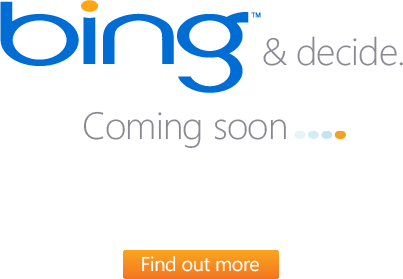 “While the search sector is excited by the prospect of a new service, only time will tell if Bing is to have a permanent impact. The industry has seen numerous new engines launched over the years – including several by Microsoft – and it’s fair to say they haven’t been hugely successful,” said Andrew Girdwood, Head of Search at bigmouthmedia. Bigmouthmedia, independent digital marketing agency, has launched a new cross-industry campaign to promote a career in Search and digital marketing to university graduates. The move follows the recent publication of survey results revealing that the majority of Scotland’s new graduates feel that higher education should do more to connect students to potential opportunities in emerging industries. The research, which was conducted earlier this year by bigmouthmedia, also revealed students’ beliefs that universities are failing to adequately prepare leavers for life in the real world. Despite the fact that search marketing has grown from nothing to become a £1.2bn a year business in the last decade, until now none of the UK’s careers advisory bodies have listed search engine optimisation or digital marketing amongst the options available to graduates. However, following consultations with bigmouthmedia, Careers Scotland have now updated their records to reflect the industry’s growing significance. While continuing to work with the relevant sector Skills Councils in Scotland to ensure that information is available to entry-level job seekers, bigmouthmedia now plans to carry the campaign to the rest of the UK and Europe. “Every year companies like bigmouthmedia hire a raft of recent graduates, yet our experience attending university careers fairs tells us that many new entrants to the workforce are simply unaware of the opportunities available in the sector,” said Lyndsay Menzies, Managing Director of bigmouthmedia UK. “It’s often been joked in the search marketing space that no one wanted to be a search marketer when they grew up. Such jobs didn’t exist. Now they do, and it’s great to see that careers services are catching up to help provide education for this important career,” said Danny Sullivan, Editor In Chief, SearchEngineLand.com. The results: More than 4.5 million contextually targeted unique visitors have effectively been shared among the web sites contextually linked in during the entire 2007. This year the figures seem even better and the site is currently on track to surpass the 10M uniques mark for the entire 2008. Small to mid level sites are really benefiting from having their web sites, pages and content areas contextually linked in LinkedWords’ massive contextual platform built upon 38 Million English words, phrases and whole sentences organized into semantic structures from contextual paths to deep meaningful categories. What does LinkedWords do after all? 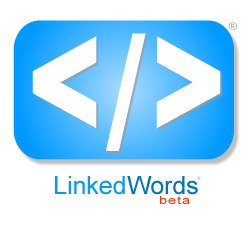 LinkedWords (LW) is an innovative contextual platform built upon millions of English words and phrases organized into contextual categories, paths, and semantic URLs whose mission is to maximize contextual linking among web sites across the Web. Since its launch in June 2006 LW’s concept has essentially proven to be very effective vehicle in helping web sites getcontextually linked on a content area level so thatInternet users and smart robots discover their information in context. Correct in-text contextual linked words (hyper links) help our platform, 3rd party sites and semantic search engines all direct relevant Internet users to the web sites contextually linked in. And the last but not the least, it is FREE for your web site to contextually connect to the LW’s platform and start getting targeted traffic, today. Ok, but how do I contextually link my site to LW’s platform? After getting familiar with how it’s done you can browse or search the 38,050,000+ English words-, phrases- and sentences-based pages and categories organized into contextual paths, find the strategic ones for your web site / content and get then contextually linked with. Small to mid-level web publishers looking to improve the visibility and increase the targeted traffic of their web sites can make as many as possible contextual links through LW’s platform. Alternatively, practical examples of already linked words can anytime be seen on the site’s home page. The last, but not the least, LW is all about contextual information therefore to assure best results make sure 1) the context of your page, in which you make your linked words, matches the contextual path to the words/phrases you make the contextual links to at LW’s platform, and 2) you link only words/phrases that grammatically belong to and are organically found within sentences inside your text and these linked words are surrounded by meaningful content otherwise no contextual connections can be created, which yields no results and is ground for deletion. Proper contextual paths/categories and in-text linked words yield better contextual results. If no words or phrases are found for your specific content, or they are not in the right contextual paths/categories, you can always create your own words and phrases in the most appropriate paths/categories to match your page’s context.